Saw it at TIFF. 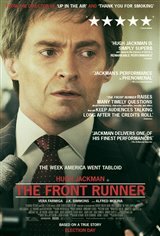 Not sure what the filmmakers (or Hugh Jackman) are trying to say, but I would not want to vote for anyone who was a cheat and a liar either. I'm glad Hart's political career went kaboom. He deserved it. And I don't feel sorry for Donna Rice, even though the movie's secondary plot tried to manipulate the audience into that. She slept with a married man. She knew he was married. She keeps saying how intelligent she is, but she's just a dumb bimbo. She got what she deserved too. The innocent people here are Hart's wife and daughter. That's who I feel for. They got the short end of the stick. What a despicable man she married, she should not have stood by him for a minute (same goes for Hilary - whom I would have more respect for if she'd left that bum).